Washington has declared a state of emergency as Hurricane Florence is set to deliver a direct hit to the US East Coast. Florence, as per reports, is a category 4 storm with winds of 130 miles per hour (210 kph), and is currently about 905 miles (1,455 km) east-southeast of Cape Fear, North Carolina. Washington has declared a state of emergency as Hurricane Florence is set to deliver a direct hit to the US East Coast, threatening torrential rain and floods in the capital region. According to Washington Mayor Muriel Bowser more than 1 million people have been ordered to evacuate their homes as the nation’s capital prepares for heavy rains, flooding and power outages. Florence, as per reports, is a category 4 storm with winds of 130 miles per hour (210 kph), and is currently about 905 miles (1,455 km) east-southeast of Cape Fear, North Carolina. 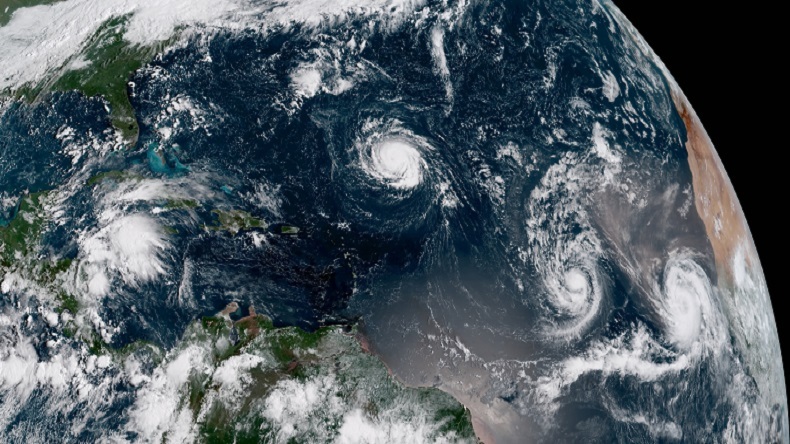 According to the US National Hurricane Center, Florence is expected to strengthen further as it is ready to move over the southwestern Atlantic between Bermuda and the Bahamas on Tuesday and Wednesday. It added that the hurricane should approach the US coast by Thursday. As per the latest National Weather Service of America update, Florence could rival the impact of Hurricane Hugo, which wreaked $7bn (£5.3bn) in damage and claimed 49 lives in 1989. Not only, Washington but the Governor of Virginia Governor Ralph Northam has also cautioned the people in his state predicting “catastrophic inland flooding, high winds and possibly widespread power outages”. Keeping in view the potential devastation, President Trump has also assured the coastal states of federal assistance. “Just had calls with South Carolina Governor Henry McMaster, North Carolina Governor Roy Cooper, and Virginia Governor Ralph Northam regarding the incoming storm. Federal Government stands by, ready to assist 24/7,” Trump tweeted.